I make no excuses for posting something so simple – yet this is ultimately the…yes…ultimate fast food in my humble opinion. 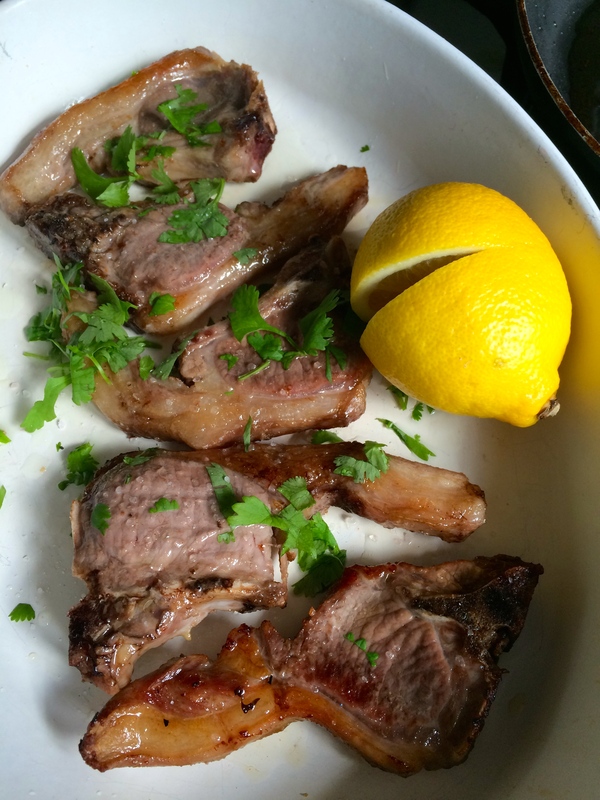 It is all down to getting some decent lamb cutlets – add them to a lightly oiled warmed griddle pan. Pop under a hot grill for 4 to 5 minutes per side for medium rare – you need them pink in the middle but crispy outside. Remove from the grill, grind over some sea salt and then flitter a handful of chopped coriander over them plus a good squeeze of fresh lemon juice. I ate them today for lunch with just a few slices of warm baguette. Tis perfection on a plate. The Spanish name for them makes them sound even more romantic…they are nevertheless scrumptious to nibble on however named. Possibly my longest title to date! Couldn’t think of anything witty, well I could but they were all very corny. Anyway, this is a fabulous supper, inspired simply by my memories of our days in New Zealand where it seemed every other restaurant was doing some variation on the theme of lamb steaks piled on something or other, infused with this or that. I often pined for just a plain lamb steak…they were not easy to find..all the chefs wanted to ‘out sauce’ each other or come up with another way of disguising the lamb…possibly because they had so damn much they had become stone bored with the simple plain taste of…lamb! Well, I am in ‘fancy lamb steak denial mode’…so wanted for the first time in many years to recreate a dish like I experienced in Wellington. This is my offering and it is very, very simple. And yet delightful. I first rubbed each steak with cumin seeds and left them to think about things for half an hour or so. 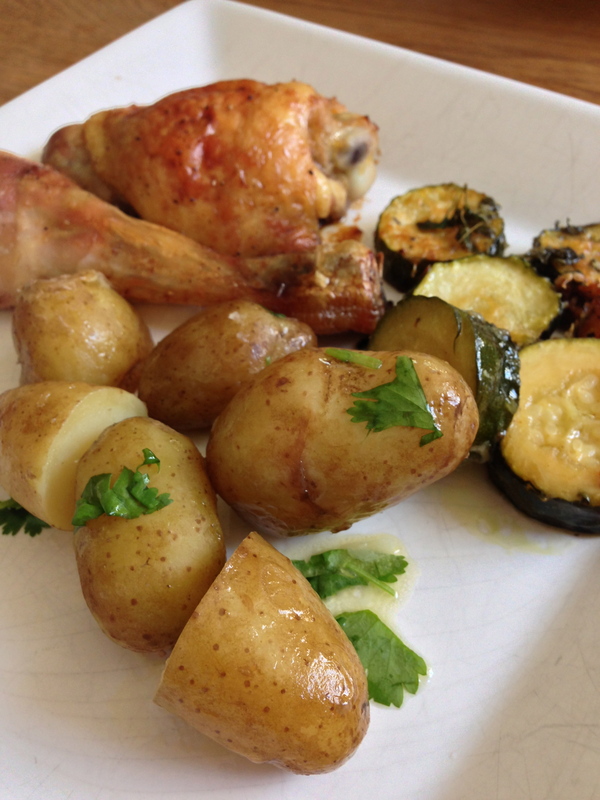 I used a small bag of Venezia new potatoes which I boiled until they could just be pulled apart – about 20 minutes. I then drained them and popped them back in the pan with the lid on to steam a while. I put a large knob of butter in a wok, melted it over a low heat and then added a bag of spinach, wilted it for about 10 minutes, added some black pepper and a little salt. Then put it in a sieve and squeezed the water out. Then it went back in the wok to keep warm. I chopped 2 cloves of garlic and slipped them into a small pan with about 80 grams of butter and let them melt together. The steaks were then pan fried in a heavy based skillet for three minutes a side in a tiny amount of olive oil. The fun part is building the stack. The potatoes need a good grind of rock salt and a little butter before crushing them with a potato masher, but not too much. Arrange them on the plate, top with a spoonful or two of the spinach, put a steak on the top and drizzle with the garlic butter. Then just tuck in….tis is a silken dish of buttery flavours that meld together like a marriage made south of the equator. Cooked this again last weekend for some good friends – here is the recipe from June in case you missed it! Ok. I’m back in the saddle. I was walking by mid day yesterday and compus mentus by 4 pm-ish. I had to do something to stop me feeling any more sorry for myself so I went for a dish for supper that, were anyone ever to ask me – what would your last dish be – this would be a strong contender. I normally do it as a supper dish for lots of folk – but I thought – sod it – let’s do it for me for a change! So, by 6pm I was back in the kitchen and a rush of well being and harmony poured over me. Today, I feel a little iffy again – but I am getting there. Anyway – enough about me – it is the food that is centre stage here! This is a dish I came across in Spain Quixotic Donkeys years ago..it is a dish from Aragon originally and a chilindron is a type of low sided earthenware cooking pot..apparently. Cordero is – of course – lamb. Look, anyway, the point is – this is a seriously fine dish – peasanty, satisfying and perfect for friends to gather round with hunks of bread, glasses of wine and rich conversation. 250 gm fresh peas – though tinned will do if you must! 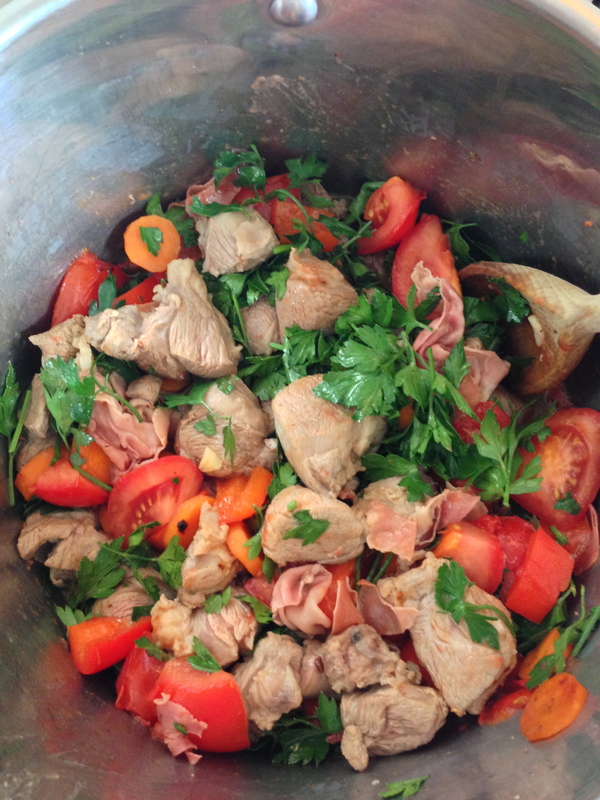 Ok…pop the lamb chunks into a dish and mix well with the garlic – leave for an hour. Heat a tbsp of oil in a sauté pan. Pan fry the ham for about 30 seconds, then transfer to a casserole dish that has a tight fitting lid – you will be cooking on the hob – not in the oven. I use one of my stainless steel dutch ovens. Fry the lamb chunks next in same oil until browned – add to casserole. Sauté the carrots, then the peppers for about 5 minutes each and add to the dish. Then the tomatoes – til just starting to soften and colour. If need be add more oil at any point. Now add the wine and chopped parsley to the pan and let it bubble for a second or two, then add to casserole with any scrapings. Mix it all together. There should be about an inch or so of wine – if not add a dash more and top up your glass at the same time – cook’s perks! Put on the lid – I add a layer of foil first just too make a really tight seal. Turn heat up high under the pot and cook on high for 20 minutes – shaking pan vigorously to stop it all sticking. Take a peep after maybe 15 minutes and if necessary add a little more wine and turn heat down a little. But be brave! After 20 minutes add the peas. Lid back on and cook for a further 20 minutes. You can now, if you wish, just turn the heat off and move the pot to one side for 5 minutes of you wish – or if you are still chatting! You will not believe that lamb can cook this fast and be so, so tender. It will be like carnivore velvet. I serve on a white pre warmed dish to place in the centre of the table or in a pre warmed roasting tin, with shed loads of good crusty bread. The idea is you want folk to be able to be served but not be shy about dipping into the main dish to get more juices! This is a dish of pure Spanish style and simplicity that leaves you feeling that life is ok after all and who cares what mañana brings. And I felt life seeping back into my veins afterwards too…alongside the tempranillo…..! 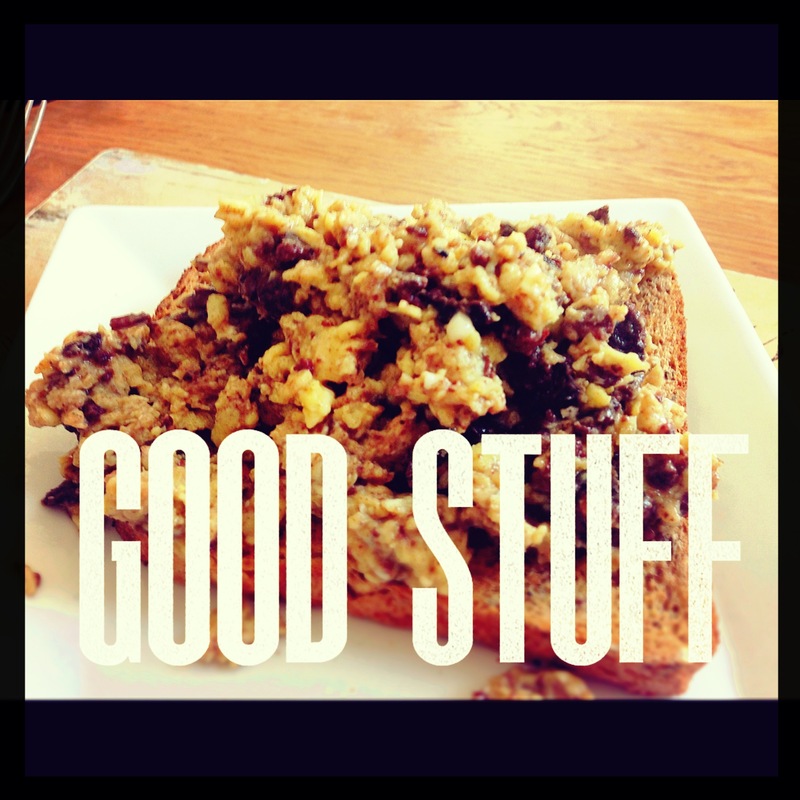 Bits and bobs May round up….aubergines, Noah, rhubarb and Eggs Warhol…etc! is this morning’s breakfast. It scores little, if anything, on looks… I agree…but the flavour was bang spot on. 2 eggs lightly scrambled with a slice of black pudding pan fried and then crumbled through the egg mix midway through scrambling. It mellows out the pud flavour and is immensely filling in a nice way! Anyway – there you go – it had a sort of Andy Warhol look – a good name maybe for it – Eggs Warhol. 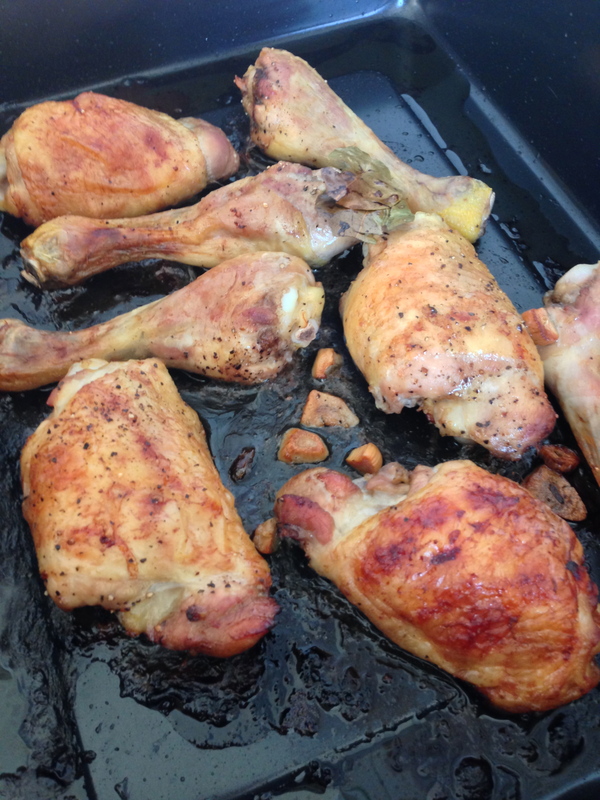 At the weekend I marinated slashed chicken thighs in sloe gin, slivers of garlic and bay leaves for an hour. Then roasted them for about 40 minutes til crisping. 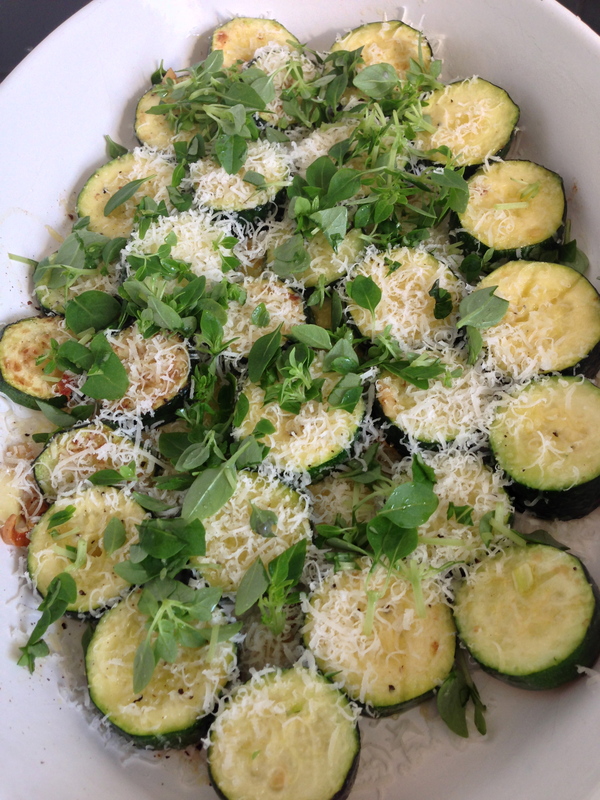 I served them with courgettes oven baked ( I had pan fried them lightly first) with snowfalls of parmesan, drizzles of olive oil, garlic and a handful of Greek Basil – I love those gorgeously aromatic tiny leaves. Oh and I also did Jersey Royal new potatoes in butter and coriander on the side too. Got to make the most of these beauties whilst they visit! Popped into Morrison’s near Basingstoke – as it is to me – one of-if not the best – supermarkets in this whole area. Nearest I have been to a French or Spanish affair. The veg counter is a work of art and has a huge variety of veg not normally seen anywhere unless you live in Brixton or some other marvellously multi-cultural spot. Everything from these gorgeous Graffiti Aubergines at the top of the page, to eddoes, fresh turmeric rhizomes, several different varieties of chard, cassava, different gourd, about 10 different types of chillies, elephant and rose garlic, hundreds of fresh herbs – all being sprayed gently with cold air. 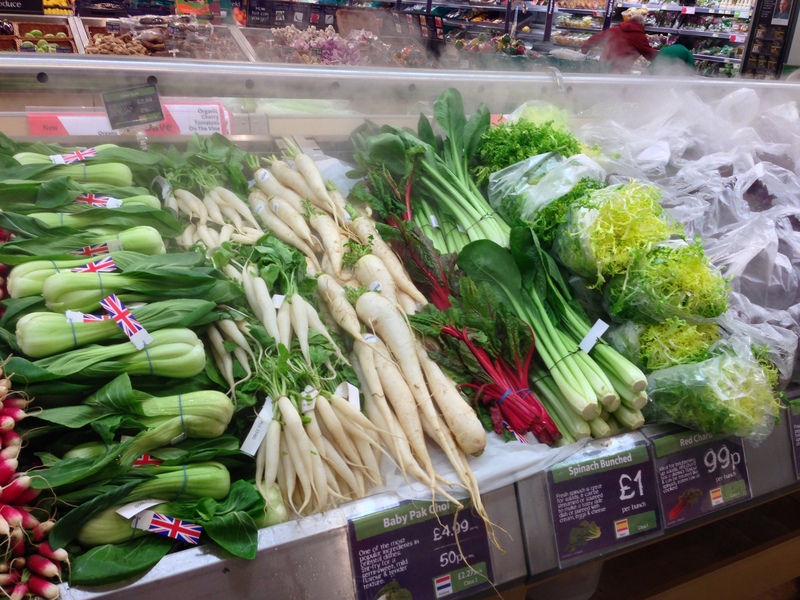 All fresh – nothing in plastic bags! The fruit counter is equally as fascinating – plus they have a phenomenal fish counter and a butchery populated by guys who are ACTUALLY butchers and know what they are talking about! If you have to shop in a supermarket then this slice of paradise is it. Right, enough sales talk – and I won’t even get commission! 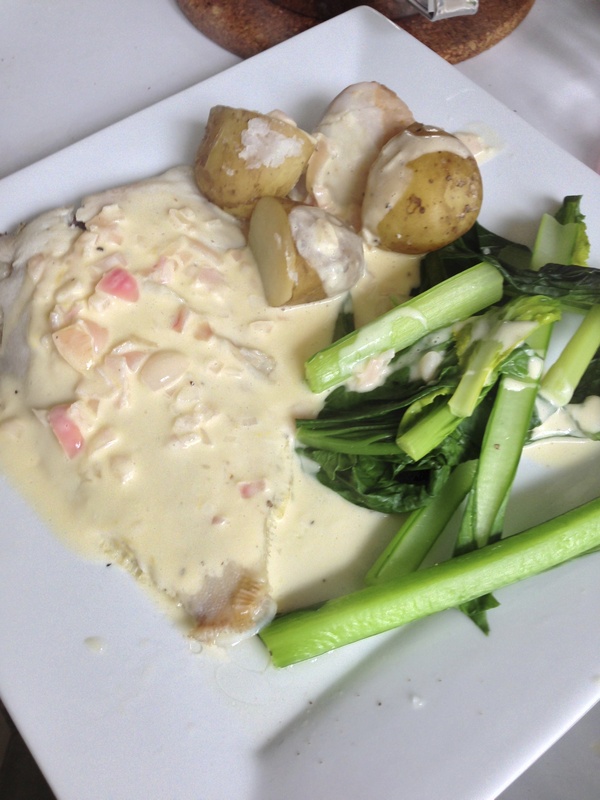 Yesterday’s lunch was lemon sole in lemon beurre blanc sauce with spinach and new pots- again! Last night’s supper was a version of a Keith Floyd dish that I only seem to ever cook about once a year but I love it – it is simple and has a sort of Turkish / Greek feel to it. 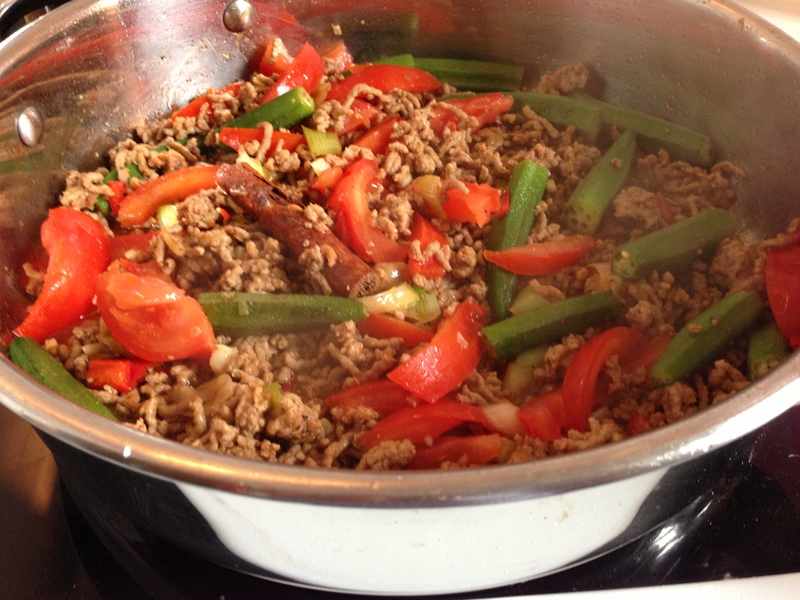 He just calls it Minced Beef and Spinach – but I often miss out the spinach and I also like using minced lamb, which I did last night. Being someone who can’t just follow a recipe – I have to fiddle. But is that not what it is all about? Anyway – I did. Fiddle on! Stir fry the okra, onions and half the garlic for about 2 minutes in olive oil. 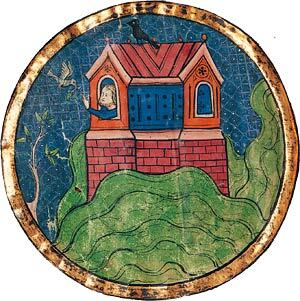 Set to one side. Next, in a mix of butter and olive oil, fry the minced lamb for about 5 minutes. Then add the cinnamon stick, the paprika and the rest of the garlic plus the chilli. Sprinkle in some black pepper too and a grind or two of sea salt. Add in the tomatoes and the okra, onion mix. Continue to cook – it will be about 30 minutes in all. Adjust the seasoning to taste. 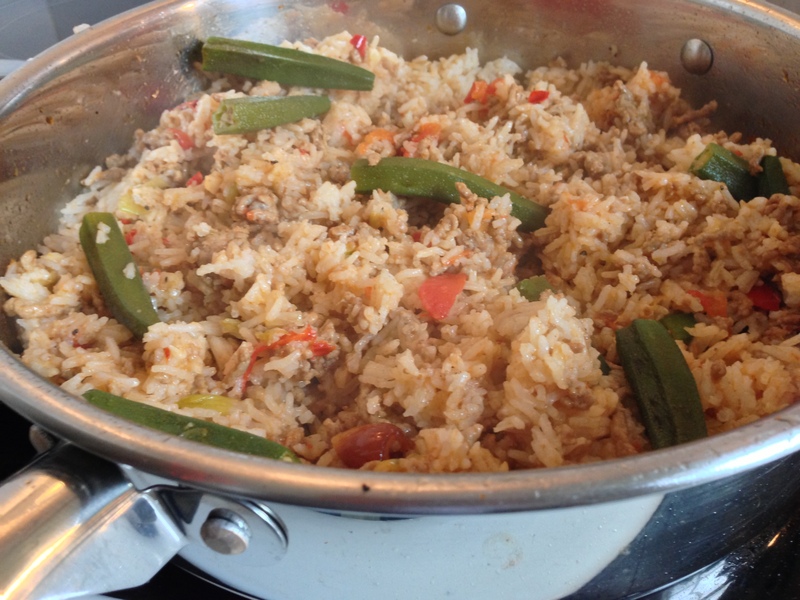 I then cooked basmati rice – enough for 4 – and stirred it into the lamb dish. You could serve it separately if you wish with some plain yoghurt – I like the buttery texture of stirring it all together though. Simple and summery and perfect for supper. Right – out now to pick some rhubarb as the Ark appears to have docked for a while and the sun is considering making an appearance. Today’s Sunday lunch. This is a dish I have fiddled about with quite a bit over the years. I have made it with neck of lamb fillet, but today I used a kilo of marvellous diced lamb from Parsonage Farm in Upton, Hampshire where I like to buy a lot of my meat. Check them out on Twitter.Dust the diced lamb in flour, salt and black pepper, Pan fry in olive oil til coloured. Remove to a large casserole. Then deglaze the pan with a splash of red wine. Add juices to the casserole. Then pan fry for about 5 minutes 10 or 12 shallots. Add to casserole. Then pan fry about 10 or 12 cherry tomatoes for 5 minutes and add the to the pot too. Then put the casserole on a low heat, add a good bottle of red wine, two bay leaves and a squirt of tomato sauce or puree. Chop a big handful of fresh mint and add that to the pot as well. Bring to the boil, then turn down to a simmer and leave for half an hour with the lid on. Remove lid and continue to simmer for another hour. I served it on a bed of mashed and buttered potatoes through which I stirred 100 grams of spinach. The look and taste is gorgeously warming and richly fulfilling!